All-in-one printer/scanner/copiers are nice and all, but everyone knows that you don’t really need ink to scan a picture. That doesn’t stop manufacturers from making our gadgets unable to perform other functions when they’re out of printer ink, an intentional flaw that is wasteful and frustrating. This week, we’ve heard from owners of Epson, Canon, and HP all-in-ones who complain that the devices are a useless lump of plastic without a print cartridge. They aren’t the only companies to pull this trick, but some tipsters have let us know that there are ways around the flaw. Brandy tells us that her Brother printer also requires yellow ink to print black and white. Brother printers are no better than Epson or Canon. I have an all-in-one with tri-color and black ink. Currently the yellow is out and it won’t let me print grayscale or “black and white” only prints because there is no yellow ink. Makes absolutely no sense to me but that’s the score. Kestris notes that her Kodak all-in-one does the same darn thing. Kodak AiO printers are the same way. Once a cartridge is empty- black OR color, doesn’t matter- the printer will no longer work until that cartridge is replaced. All is not lost if you do want an all-in-one, though. Reader Rey has a Brother printer that doesn’t have this intentional design flaw. Seeing the intentional design faults of all-in-one printers from Epson, Canon, and HP, I’m all the more pleased to have the all-in-one Brother MFC-6890. Not only will it run its functions normally even when out of ink, it will print even if one or more color cartridges is empty. The image may not look great with a color missing, but it lets the user do it. 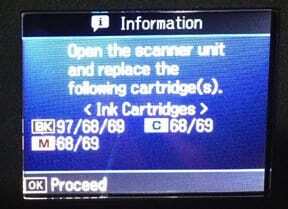 Reader Nicholas notes that Canon’s laser printers do let you scan without a toner cartridge as well. “Small & Medium business class printers often may not be as shiny, but they do the basic features far better than home printers,” he writes. He owns a Canon MF-4350D. There is a very easy way to use all in 1 printers without ink (at least for my Epson all in 1). Use the Windows built in scanner software instead of the software that came with your printer. You can access this by clicking “Start” then “Devices and Printers.” Then, you should be able to select the scanner icon, which launches the windows scanning utility. This will work regardless of ink status. Someone has even created a snazzy, yet annoying video showing how to do this, in case you’re more of a visual learner. Other readers reported that there’s a way to bypass the empty-cartridge whining on Canon all-in-ones and printers: hold down the stop/reset or the power button (depending on the model) for five seconds, unlocking the device’s other superpowers.